The Parisian Damask Stencil arrived yesterday, just in time to create a card for my post! I actually have a few other pieces sitting on my desk, just need to turn them into something, and then I'll share those. This beautiful stencil can be found in the Decor Elements Catalog (to view the catalog just click the SU Catalogs Button in my banner). To create my card, I inked the open areas of the larger Damask with inks and a sponge dauber. Removed the stencil, then placed the other stencil over my image and inked with darker inks. Once dry, I sponged the edges, then went over the entire piece of Watercolor Paper lightly with a sponge dauber and Chocolate Chip Ink. The sentiment is from the Stampin' Up! set Great Friends, stamped in Chocolate. 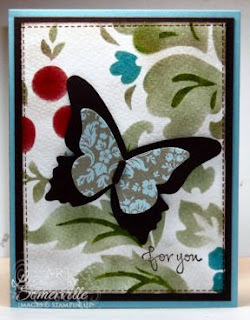 The Butterfly was cut from Chocolate and Parisian Breeze DSP using the Butterfly Die, then popped on dimensionals and placed on the card, I added the body with the Horizontal Slot punch and a piece of Chocolate Chip card stock. To finish the card, I added some stitching using the Dry Wall Stitching Technique. After staring at the card for awhile, I think I'm going to change the paper on the butterfly, but since it's late while I'm writing this post, and want to get it scheduled, I'll have to do that tomorrow. Stamps - Great Friends - Stampin' Up! Gorgeous card, Lisa! !Love the layered butterfly.